Tablet kiosks or monitors are prominently located at the entrance to each course location and provide course information and confirm enrollment and participation for session attendees. With a simple tap of the attendee's NFC registration badge, the attendee's name, session and admittance verification are displayed and immediately recorded for CE credit. This information is also sent in real-time to the attendee's mobile device showing all CE sessions attended and earned and to the event management's mobile app that provides event-wide session statistics and analysis. Convergence has developed software that allows each station to be individually programmed. This means your CE tracking stations can now take on double duty. Now you can deliver push messages, add sponsor logos and even display full-page advertising whenever desired. In many cases, this option opens entirely new revenue opportunities for the organization. Because our NFC SmartCard registration badges can do so much more than an ordinary badge, they are also very popular with sponsors. NFC badges can be used well beyond session tracking for special event access, meal and beverage payment, lead retrieval, games, exhibitor promotions, transportation and more. They can even be used after the event is over for promotions, discounts and other purposes. Our mobile session monitoring app keeps event management in the know and in control with our unique mobile application that provides information in real-time about every aspect of the meeting sessions and events. 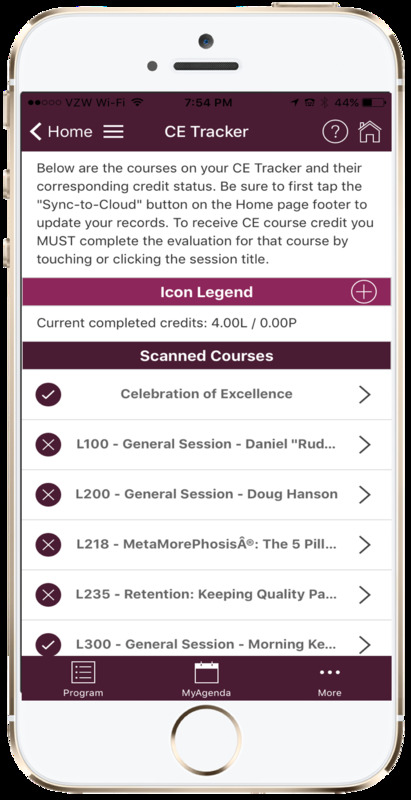 Use the app to view session attendance, room capacity, speaker evaluations, CE credits earned, meal functions and much more. Critical information is now available right at your fingertips as it happens. USE THE SCROLL ARROWS TO THE RIGHT TO VIEW ADDITIONAL APP FEATURES. CLICK ON THE IMAGE FOR LARGER VIEW. CE session information, including credit completion status, is available immediately on the attendee's mobile device. Course evaluations can then be completed and submitted in seconds by the attendee, even while still in the session. No more wondering by attendees or questions to event management about whether CE credits have been received. Event management benefits by getting immediate feedback on the session and speakers through the completed evaluations. Convergence is one of the only companies in the industry to integrate CE credit tracking into the event's mobile planner.